Dancing in the rain, fun! Driving in the rain, nerve wrecking! Unfortunately, all of us with a license and vehicle will have to do it every now and then to get to where we need to go. As September is typically a wetter part of the year as the seasons transition, you might be exposed to more rain that you might like. Check Your Tires: The older and more worn out the tires, the more unsafe they are in a rainstorm. Your tires should have treads that are deep enough to grip the road and prevent sliding. If your treads look worn, you might want to take your vehicle to a tire shop to see if they would recommend that you replace them. Make Sure Your Headlights Are Turned On: In most states, the law requires that you have your vehicle’s headlights turned on during a rainstorm. Rain reduces visibility, making it essential that you make yourself as visible on the road as possible. When it starts raining, turn on your headlights. Check Your Wipers: Unfortunately, windshield wipers do not last forever. They collect grime and dirt, which overtime, will cause them to not work as well as they once had. You’ll notice when it’s time to change your windshield wipers because they will leave streaks or wet patches on the windshield. When you see these, you should replace the wipers as soon as possible for your safety. 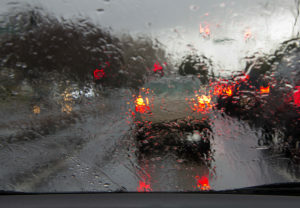 Don’t Drive Aggressively: When it rains, it not the time to test out your vehicle’s horsepower or brakes. Give yourself extra distance between you and the vehicle ahead of you, and try to drive ten miles per hour less than you would normally would. This will ensure you have enough stopping distance in the event that you need to make a quick stop. Also, make sure to keep your focus on the road and be courteous whenever you can be. While eTags’ business focus is to provide vehicle owner’s in California, Florida, and Maryland a convenient online option for registration renewal, their social focus is on driving safety. Remember these tips from the eTags team the next time you are caught behind the wheel in the rain.